Susan L. Roth and Cindy Trombore have earned many honors and praises for their picture books including the 2014 Robert F. Sibert Medal for Parrots Over Puerto Rico. Their new nonfiction picture book highlights the role prairie dogs play in maintaining the balance of the grasslands in North America. As the title states, the story takes the form of a song. Each page features a stanza from the song as readers learn about the grasslands ecosystem and how prairie dogs help the grasses and make the soil rich. That you ever did see. Their homes in the ground. And the grasses waved all around." One of the strengths of the book is its unique design. Expository paragraphs are placed below the song stanza on the left side of the page. Younger readers will be able to access the narrative/song part of the story while older readers (grades 3-5) will find the information provided in the expository sections of interest. Lush, paper and fabric collage illustrations depict animals, plants and people in the grasslands. Roth uses a variety of material to show the many textures and complex colors of the prairie. A detailed timeline with photos, glossary and sources are listed in the back matter. Readers who are interested in music will appreciate the music and lyrics published in the back of the book arranged by Dale Trumbore. Prairie Dog Song could be read aloud to science classes studying ecosystems or writing classes learning to write in narrative and expository styles. Pair with No Monkeys, No Chocolate by Melissa Stewart and ask readers to compare and contrast the concepts in the two books. 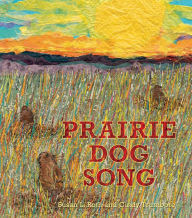 Visit the publisher's website to view pages from the book and to hear the Prairie Dog Song. Thanks for this review. Sure would be interesting to learn how Roth came up with the idea of song plus expository. Or maybe it was an idea born in the design phase? I enjoyed this one, and thought the format was quite interesting. I loved the way it explored the grasslands ecosystem in this way. Though I love the texture of the collage, I think the style sometimes made it difficult to see the various creatures in detail. I think it has some deep meaning in phrases of this fog song, that thanks for the valuabe information and insights you have so provided here.